Saginaw County has granted the sheriff permission to sign off on a grant worth over $6,000,000. The money will be used to convert the Saginaw County Sheriff’s record database to a statewide information sharing system. It’s called the Area Records Management System database, or ARMS. It provides information to more than 1,500 individual users. Officials said participating agencies pay a 267-dollar-per-officer annual fee to use the system. First Lieutenant Allan Renz is with the Michigan State Police. “The main thing here is this is just good police work. This is good collaboration between all of these law enforcement agencies and come together, and work as one team to combat crime in order to have a positive outcome. And using this data in order to make a difference to the citizens of the state of Michigan,” Renz said. Renz said the goal is to grow the number of users to at least 6,000 within the next five years. He said the more users the system has, the more self-sustainable it will be and the more money it will save for local agencies and communities. New FBI crime numbers rank Flint and Detroit as the nation’s most-dangerous cities. Detroit’s rate of overall violent crimes dropped in 2011, but it still posted the nation’s second-highest murder rate. Flint also reduced the number of violent crimes, but still ranked as the most-violent city on a per-capita basis. “We have cities in Michigan that are too high in crime and we need to continue to work that,” was the reaction from Governor Rick Snyder. But the governor was quick to defend his administration’s crime-fighting record. Those cities were targeted early in his administration as high-crime areas that need to be fixed. Flint and Pontiac were also takeover targets under the state’s emergency manager law. Snyder said Pontiac and Saginaw have unacceptably high crime rates, but notes they have dropped off the list of most dangerous cities. Officials are identifying the suspects in Monday night’s shooting of a State Police Trooper. 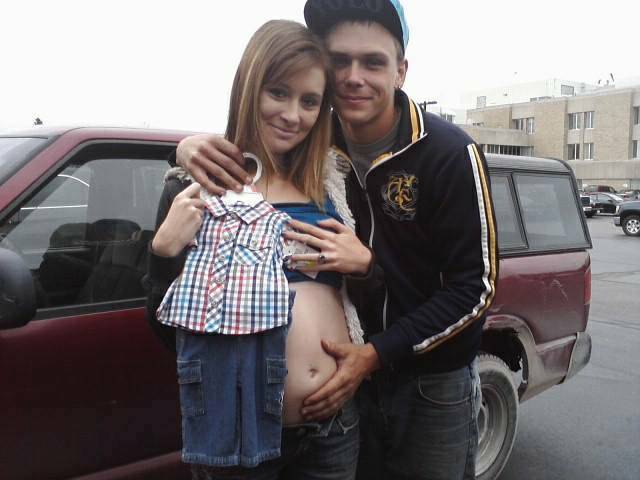 They are a young, married couple who are expecting their first child. 19-year old Eric Knysz of Lake county faces charges for allegedly shooting and killing Trooper Paul Butterfield during a routine traffic stop near Freesoil in Mason county. Knysz’s wife, 20-year old Sarah Knysz is being charged as an accessory after the fact. According to Sarah Knysz’s Facebook account, the couple was married in February of 2012. Sarah is pregnant and according to her Facebook, the baby is due this November. It was reported that Eric Knysz was shot in one of his knees before being arrested hours after the initial incident. He is currently at Munson Medical Center in Traverse City. John Knysz, Eric’s father and a former police officer, told CMU Public Radio that the family feels “terrible” about the situation. Police in Standish are using dental records to identify human remains found this week behind a local store. Investigators said it appears the remains are at least two years old. Police would not said whether clothing or personal items were found with the body, or whether police have any indication on a cause of death. Don McIntyre is the Arenac county undersheriff. “Three children were in the woods behind Family Fare grocery store in Standish city, when they found a human skull. They reported that to us, we conducted a thorough search of the woods behind that grocery store and locate the rest of the human remains,” said McIntyre. McIntyre said investigators hope to have an identity confirmed within a week. A 14-year-veteran of the Michigan State Police is being remembered as a hardworking trooper who loved loved his job. Trooper Paul Butterfield was shot during a traffic stop yesterday evening in Mason County’s Sherman Township. He later died of a gunshot wound to the head at a Traverse City-area hospital, while undergoing emergency surgery. A suspect was located about two hours after the shooting at a gas station in Manistee County. That suspect was transported to a hospital for treatment of non-life threatening injuries. A second suspect was also taken into custody. Police are still investigating what prompted the shooting. Meanwhile, colleagues are remembering Butterfield as a hard-working trooper who truly loved his job. A Michigan State Police trooper shot in the head during a traffic stop Monday evening has died. 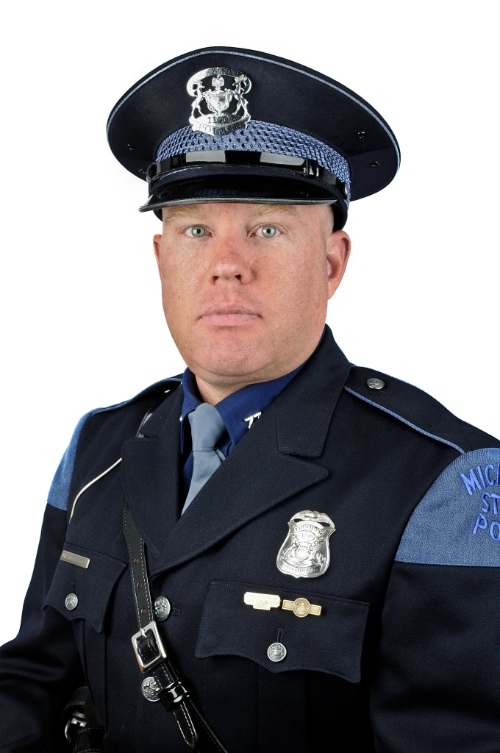 Trooper Paul Butterfield of the MSP’s Hart Post passed away while undergoing emergency surgery late Monday night. He was shot while performing a traffic stop in Mason County’s Sherman Township, near Ludington, around 6:20pm. Butterfield was found by a passing motorist, who saw the trooper on the ground, stopped and called police. Just a few hours later, two suspects were apprehended in Manistee County, following a shootout with police. One suspect was injured and taken to a hospital for treatment. Trooper Butterfield was a 14-year veteran of the State Police. Investigators, as of Monday night, did not yet know what prompted the shooting. Police in Mt Pleasant are investigating an early morning fire that broke out at Ric’s food center. The fire was quickly extinguished, but not before the store’s fire suppression system was activated. The store suffered smoke and water damage. Lt Rick Beltnick is with the Mt Pleasant fire department. “At this point the fire is labeled as suspicious, and we know that it started in that display rack. We’re looking for a couple of witnesses, potential witnesses, that were inside the store at the time of the fire,” Beltnick said. Pictures of the potential witnesses can be viewed here. Anyone with information on the fire is asked to contact the Mt Pleasant Department of Public Safety at (989) 779-5100. Also an anonymous tip line is at (989) 779-9111. In the interest of full disclosure, Rics is an underwriter of CMU Public Broadcasting.